As unified communications consultant, one of the most important things to evaluate during a project is the network, offering real-time features with delay, jitter or packet loss directly impact user experience. Microsoft released an interesting white paper about it's solution over Wireless environment, he is now available from the Microsoft Download Center. Microsoft Lync 2013 communications software on multiple platforms and device types is now validated with voice and video (real-time media) workloads over wireless local area networks (Wi-Fi networks). 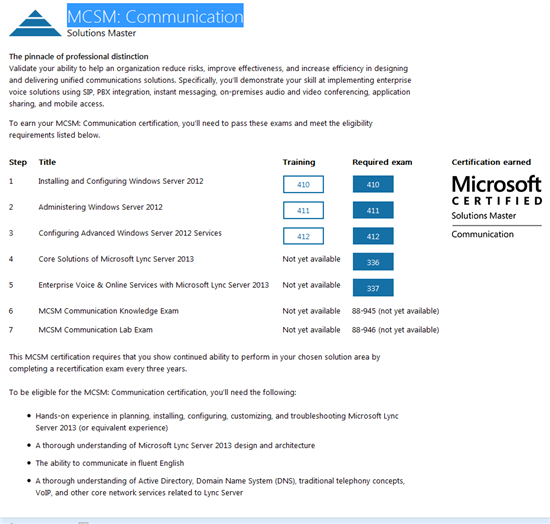 The guidance and documentation provided here also applies to Lync 2010 deployments and earlier releases. However, full Wi-Fi support will be available only with a Lync 2013 client. Changes in the Lync media stack available with Lync 2013 will improve overall performance on high-loss, high-jitter wired or wireless networks. To optimize the wireless infrastructure, in particular for real-time media traffic, this guide provides details regarding Wi-Fi (WLAN) technology, configuration settings, and optimization. In addition, this guide provides deployment recommendations and evaluates typical enterprise, public hotspot, and home Wi-Fi deployments for real-time bidirectional media quality. The name of Lync 2010 Phone Edition is changed to Lync Phone Edition. 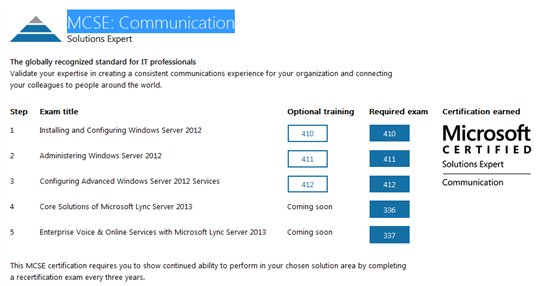 The software works with both Lync 2010 and Lync 2013. Damaka's Xavy, a Full-Featured Native Mobile Client for Lync, is currently available for FREE on iOS and Android. Damaka's Microsoft Certified Xavy app is normally $19.99 for iOS and Android, but is currently being offered for FREE. Xavy is a native mobile client for Lync and OCS R2 that provides the full feature set of Lync (white-boarding, application sharing, desktop sharing, file sharing, A/V conferencing, and IM). If you can access Lync without a VPN connection, you can just download it, punch in your credentials and sign on. Xavy Attendee and Xavy Cloud (Office 365) are currently FREE as well. I didn't see any deadline about this offer, therefore, it should be taken immediately! Impossible de partager des powerpoints avec Lync 2013. la résolution de cette erreur dans ce cas là est la non présence dans le SAN du certificat installé sur le serveur Office Web Apps 2013 de l'url interne. The new snom UC edition lineup – newly Lync qualified snom 7xx series - snom 710, 720 and 760 IP phones – and the snom 300 and 370, and the snom 821, all of which employ snom’s new Apollo firmware and have successfully passed the Microsoft Compatible Devices Program’s rigorous testing process. How to customize snom phones to meet specific business needs and processes – Boss/Admin, custom presence buttons on phones, re-branding and more. C'est officiel, le constructeur annonce pour février 2013 l'arrivée sur le marché des téléphones IP qualifiées pour Lync (donc pas un Lync Phone) des modèles 300HD et 400HD qui seront low cost. Les clients Windows 8 n'est peut-être pas en mesure de se connecter à des infrastructures sans fil existantes à l'aide de certains routeurs Cisco, contrairement aux ordinateurs Windows 7 et XP. This is the Cisco bug CSCua29504. This problem is also documented as Microsoft Support Article ID 2749073. Un peu plus d'information est disponible sur le futur des certifications Lync. Autant prévenir que le temps pour l'obtenir est conséquent, autant de certifications que pour valider le CCNP Voice, du boulot en perspective. Pour valider ce cursus, on retrouve un examen écrit et un lab à l'image du CCIE, pour l'instant, il est encore tôt pour avoir des informations sur le contenu de ces deux examens, mais je devrais en savoir plus bientôt. Q. 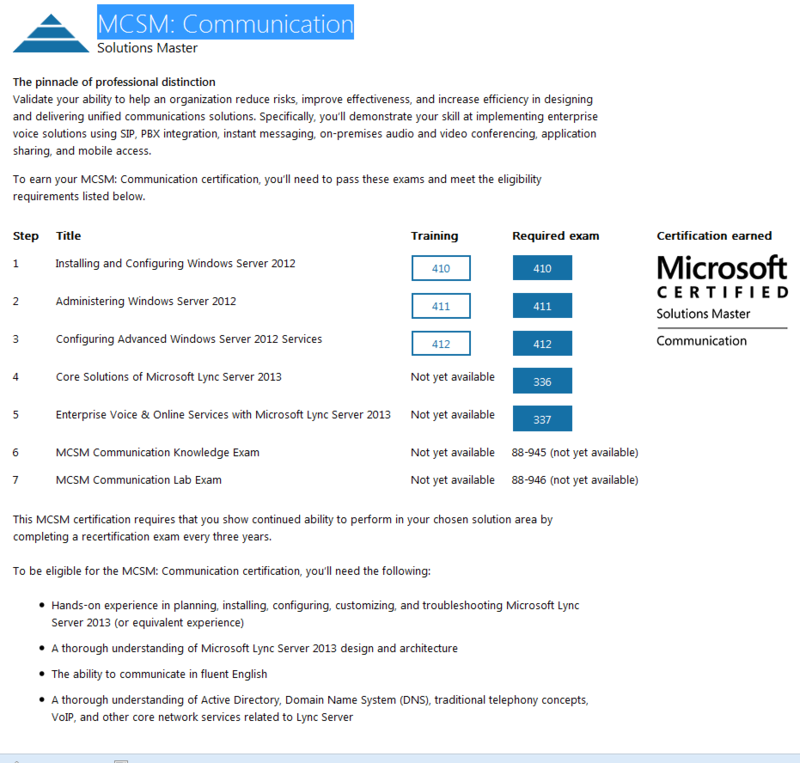 What are the recertification requirements for the new MCSE certifications? A. To ensure that our certifications remain meaningful and valuable indicators of candidates’ skills, MCSE certifications will require recertification every three years. Je vais essayer dorénavant de lister les webinars prévus pour Microsoft Lync 2013 ainsi que les technologies gravitant autour. Join Sentri for our technology webinars dedicated to the Microsoft technologies launch wave. Learn, ask and explore the newest releases for Office 365, Exchange, Lync, SharePoint, Office, System Center, Azure and Windows server or Windows 8 so you can drive innovation, save money, increase your overall efficiency. Leave each webinar with an understanding the product offering as well as next steps to pilot and deploy a solution and a clear view of the Microsoft funds that are available. Topic: Be productive on the go, communicate real time, gain business insights, create content collaboratively and connect. Grande nouvelle pour moi dans ce premier jour de l'an 2013, je fais maintenant partie de la grande famille des Microsoft Most Valuable Professional. 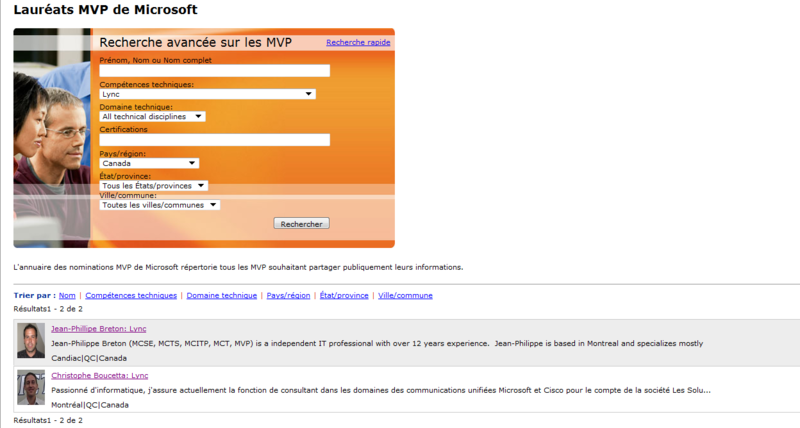 J'ai le grand honneur à partir d'aujourd'hui d'être MVP Lync pour le Canada. Merci à tous ceux qui, par leur recommandation, a permis cette nomination.